A giant pizza for $5.99? Yes please! I love buying these Take & Bake pizzas from Aldi. They're affordable, delicious, and you have a decent array of flavors to choose from. 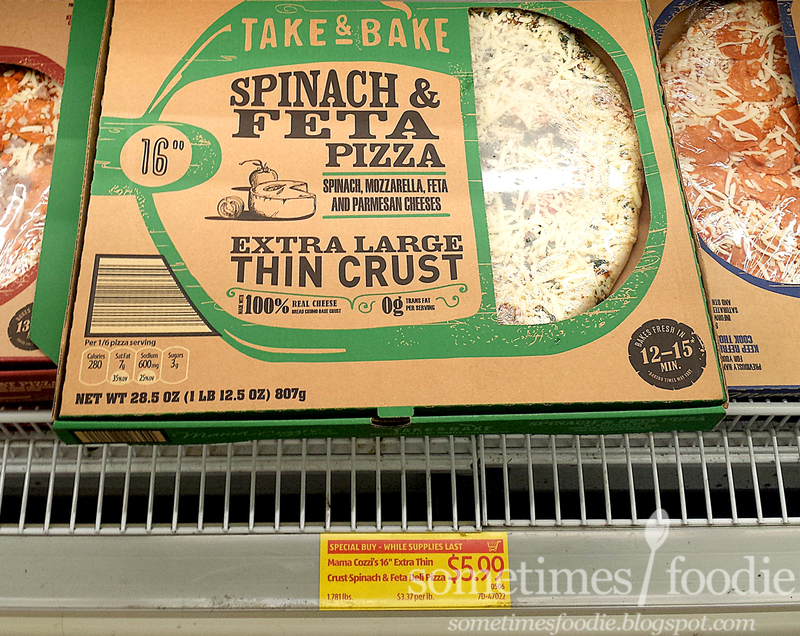 For the last year or so, Aldi started releasing Special Buy versions of these pizzas with fancier flavors, but they're only available for a limited time and the pricing varies due to the cost of ingredients. Not every special buy pizza is a winner, the last two were the Philly Cheesesteak and Chicken BBQ, which were both very disappointing, but this one...I've bought three times in a month. The box for this pizza was WAY too big for my photo set up, which is meant for tiny foods, so this photo was taken with my cellphone in the Aldi freezer case. After a string of disappointing Aldi pizzas I actually hadn't planned on giving this one a chance. I was grocery shopping on my way home from work on a Friday and had planned on picking up my go-to Supreme (which is lots of veggies, sausage, and pepperoni) but they were sold out. Since I was exhausted and definitely not making dinner, I decided to give this one a try, and I'm so glad I did. It's so freaking good! I unwrapped the refrigerated pizza, put it directly on the oven rack, and baked it for about 20-25 minutes at 350 degrees Fahrenheit, since I like my pizzas a little overcooked and extra crispy. Once it was done I pulled it out of the oven, and it smelled deliciously cheesy. 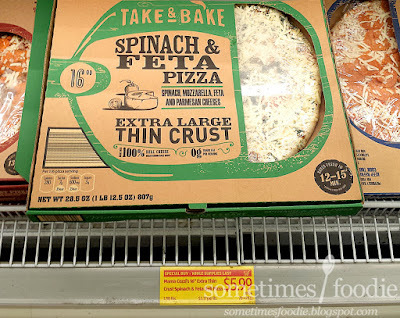 I took a bite, and this honestly did not taste like a frozen pizza, it tastes like something I would have bought at an actual pizzeria! 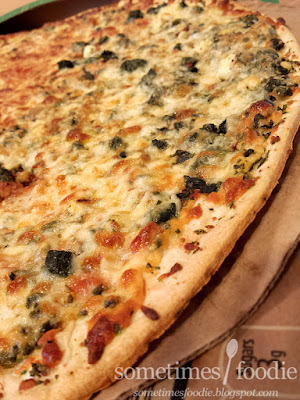 (Just to be clear, I'm talking about Americanized pizza, actual Italian pizza is entirely different.) 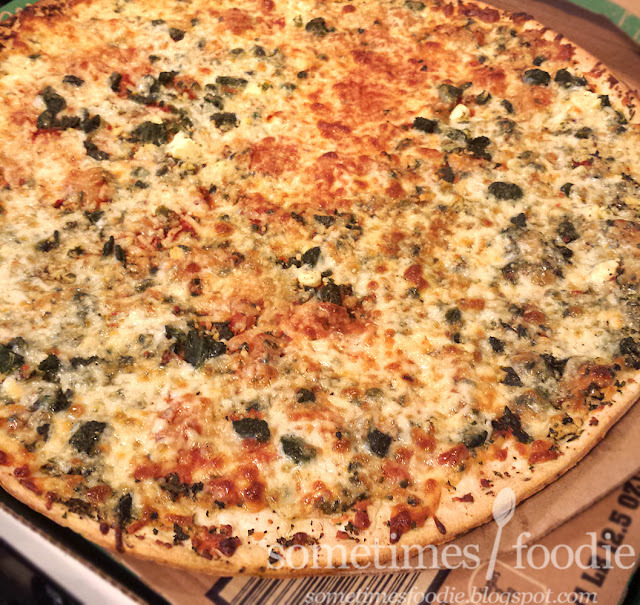 The mozzarella, Parmesan, and feta cheeses are nicely blended, no one cheese overpowers another, and the spinach compliments all of the flavors very nicely. It tastes like spinach and feta dip, but even better! Combine all of those delicious cheeses with a crispy thin crust, and this pizza was just perfect. This pizza has renewed my interest in Aldi's special buy items. I loved it so much, I bought it two more times, and I would have bought it again tonight if it were still available. Sadly, it's been replaced with a meat-lovers-style pizza. Aldi, if you're out there and reading this (which I highly doubt) make this a permanent flavor! If you bring it back I promise I'll buy this at least once a month for the foreseeable future.